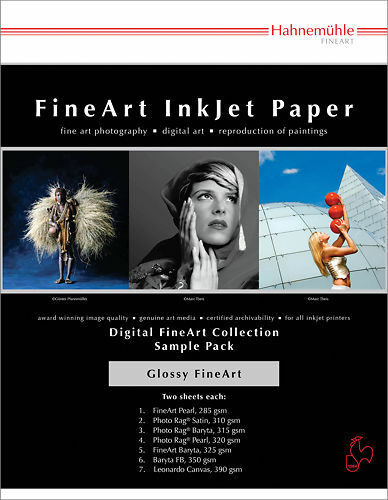 Sample packs are the best way to get an overview of what's available from the fine art inkjet paper brands. Each pack is A4 sized and comes with one or two sheets of each paper type within that range. In some cases, the brands themselves don't make a sample pack up, so we've gone ahead and made our own for them. Hahnemühle (har-ne-moo-la, or often shortened to just Hahne) are a brand with over 400 years of proud tradition in traditional paper making. They have also become the most successful fine art digital brand in the world. And for good reason - they have a fantastic range of papers to choose from. Here in Australia we're blessed with very competitive pricing and great availability and support for these papers. 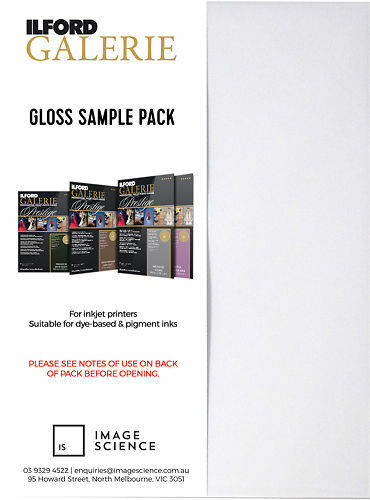 Hahnemühle have such a wide range now they've actually created three separate sample packs to choose from, broken up into the glossier materials, the smooth fine art materials, and the textured fine art materials. 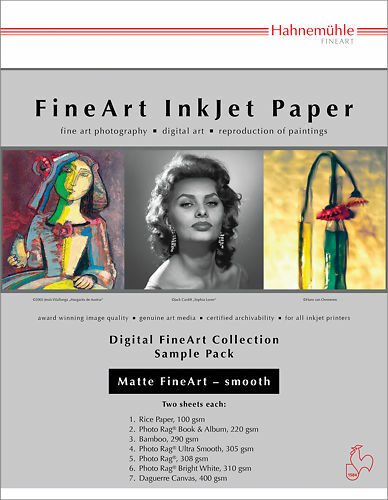 The smooth fine art materials are where they started and Hahnemühle Photo Rag, with it's wonderful smooth soft cotton appearance and feel is a legend in the industry and is by far the most popular paper of its kind. We still print more of this paper in house than anything else, including edition runs of over 1000 identical prints. From sheet to sheet, roll to roll, Hahnemühle's consistency and quality is remarkable. We make these sample pack ourselves as Ilford don't currently do one. We have separated the range into Matte and Gloss, with each pack containing two sheets of each paper for ample testing before deciding on your favourites! We update it frequently as new papers are released, choosing the best options from the current range. 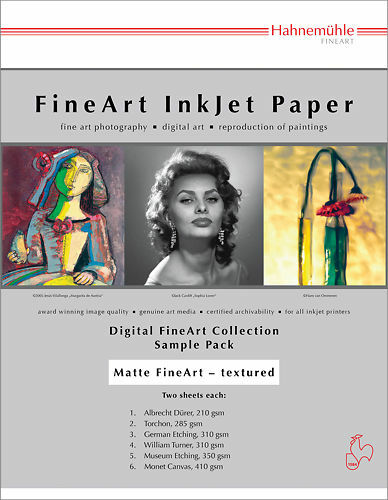 Textured and smooth matte papers from the Ilford Galerie Fine Art paper range. Museo have only a limited range of papers, but what they do well they do very well indeed. 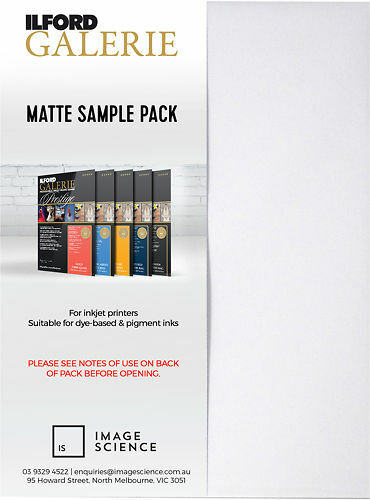 This sample pack, which we make up here, includes samples of what we think is the very best smooth matte fine art paper - Museo Portfolio Rag. Also included is the the first great 'darkroom alternative' paper that was released - Museo Silver Rag, which has the longest tonal range in deep shadows of pretty much any paper ever made. It's a lovely warm toned paper suited especially to black and white portraiture. We also include samples of Museo's excellent Artists Cards. Canson have been a paper mill since just after the printing press was invented - no one else has such a long, consistent tradition in fine art papers. If you've ever walked into an art materials store, you'll recognise names of classic art papers like Arches Aquarelle and BFK Rives. 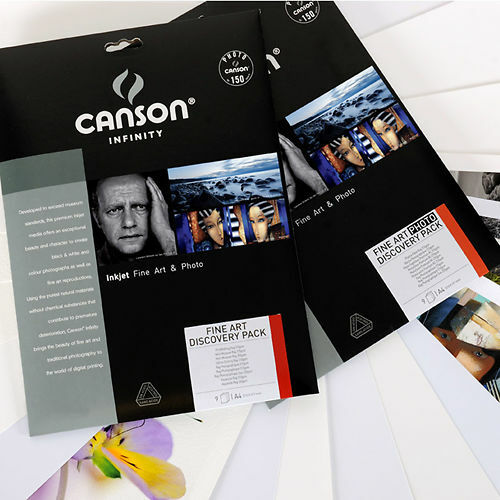 Canson have two samples packs available, broken down into art materials and photo materials (although both are printed on both of course!). 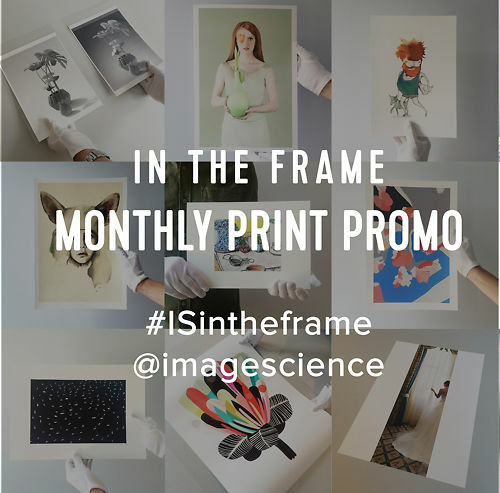 Of the two the fine art pack is the more interesting, we feel, though the photo pack includes Platine which is a highly regarded fibre based gloss paper that we print on here and a popular competitor to Silver Rag. Unlike all the other packs, which contain blank sheets, this pack contains printed samples of a bunch of excellent papers we've chosen for our in house printing services. They're just little A6 samples but it's a great way of getting an idea of what's possible and a quick overview of some of the most beloved fine art materials. This one has free shipping AND you get a $10 off coupon to use with our printing services, too, so you could say this pack is basically free! You can of course do test printing on these samples (using stock profiles downloaded from the paper manufacturer's websites as a rough test of what is achievable) - but don't worry too much about colour at this point - sample packs are really just about deciding if you like the look, feel, even smell of a paper before you really start to use it - it's not yet about perfecting your print results. All of the papers we carry are capable of superb results when used properly. 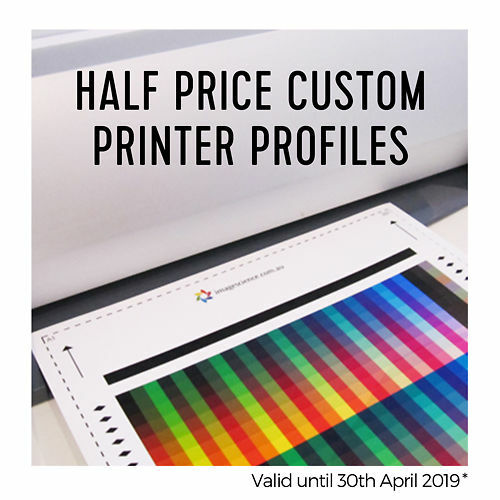 Once you've chosen some favourites from the sample packs, proceed to buying a box of A4 or bigger, and ideally get a custom printer profile for best results. It takes at least one box of a paper to properly test it!